While the tumult of the Revolution did not affect the artillery officer corps as much as it had in the infantry and cavalry, 81 percent of the artillery officers on the Army List in 1789 emigrated. This left a burden on the remaining officers, such as Napoleon, and the NCOs, which was eventually filled to some extent. Newly commissioned officers also filled the void: Marmont, for example, expertly served and smoothly emplaced guns to support Desaix and Kellermann at Marengo in 1800, smashing the Austrian pursuit and helping turn defeat into victory. Tactics employed by the artillery units in the Wars of the Revolution reflected what had been taught in the schools before the wars. Although not always successful, and many times outnumbered in guns and equipment by the Austrians, the French artillerymen learned their trade and supported their infantry brethren on the battlefields of the Republic. The horse artillerymen brought a new variable into the artillery/infantry equation, and Séruzier remarked that “they were renowned for their courage, and no less for their contentious spirit. They pushed esprit de corps far beyond the point of virtue and believed themselves infinitely superior to their comrades in the foot artillery.” Horse artillery were assigned to the cavalry as, according to Kilmaine, “it is the only way to make up for our scarcity of cavalry.” They fought alongside the clouds of light troops that screened attacks, closely supported attacking infantry in line or column, and in the advance guard of the army. 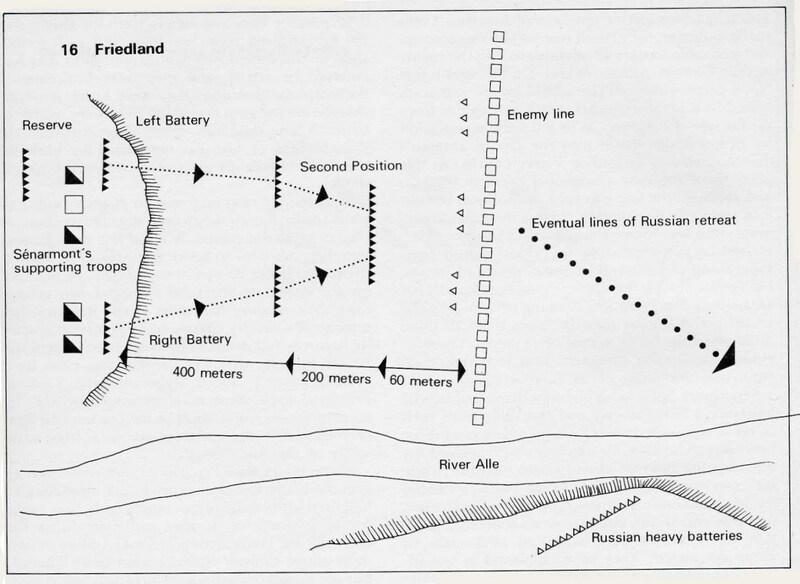 They furnished the needed artillery fire with the support that sometimes kept a faltering attack moving. At the Battle of Wattignies in October 1793, a French concentration of five artillery companies, three horse and two foot, totaling thirty guns, paved the way for the decisive infantry assault: the three horse artillery companies accompanied the French infantry, while the two foot companies conducted counterbattery fire against the opposing Austrian artillery. The doctrine taught and written about before the wars was starting to bear fruit. When the French phased out the divisions of all arms by 1800, artillery was still assigned to infantry and cavalry divisions. Artillery was initially employed to support the skirmishers in attacks, as well as being formed in multiple company batteries along the front of the army to support the infantry’s main and secondary attacks. One of the problems in the Revolutionary campaigns was that the French were many times outnumbered in artillery by the excellent Austrian artillery, and were many times outshot, as at Neerwinden in 1793. Napoleon’s coming to power in 1799 gradually changed all that. The artillery arm was enlarged, and more guns were manufactured and issued to the gun companies. The Grande Armée of 1805, the best Napoleon ever led, was short of horse transport (which is an indication that Napoleon’s actual intention was to invade England), and the artillery was short of horses when it moved east to face the Austrian invasion of Bavaria. Not all the guns and ancillary equipment could be taken until the horse shortage could be solved. Davout had to leave some of his guns and artillery equipment at Mannheim during the French offensive, to be retrieved later. After the Austerlitz campaign and subsequent peace treaty, Napoleon reorganized his artillery in a more logical manner. New guns of the Système AN XI, of which the 6-pounder, a new 12-pounder, and a 5.5-inch howitzer were being produced, and now were issued as soon as they were manufactured. What Napoleon wanted to do was issue every infantry division in the Grande Armée with two artillery companies. He also wanted one of them to be a horse artillery company if there were enough to go around. One horse artillery company would be assigned to every light cavalry division, and the heavy cavalry divisions would get two each, and all divisional artillery companies would be equipped with 6-pounders and 5.5-inch howitzers. An army artillery reserve would be formed, where most of the 12-pounders would be held. Additionally, corps artillery reserve companies would be held by the corps commanders. The 4- and 8-pounder Gribeauval guns would either be placed in the arsenals for storage as they were replaced by the new ordnance, or assigned to armies in secondary theaters, such as Italy and Spain. In December 1814, General Ruty conducted a study that favored the older 8-pounder Gribeauval gun tube over the newer and widely employed 6-pounder of the Système AN XI. His main points were that the older piece was better and more accurate, that there had been no field testing comparing the two pieces, and that the weight saved by using the lighter piece failed to give it a decisive advantage over the older 8-pounder. The 8 caliber has, in all respects, an undeniable advantage over the 6-caliber. The use of the former, in preference to the latter, could not be put in doubt if we disregarded all economic considerations in the use of the resources. If, on the other hand, we proposed to coordinate with these last considerations, rather than with the first ones, the determination of the field calibers, the advocates of the old system would appose [sic] to the 6 caliber, the 4 caliber which, for the economy of the resources, obtains more advantages in relation to the 8 caliber. Yet, if the question was considered from only one of these points of view, it would be discussed in an incomplete and wrong way. In order to grasp the real point of view of the question, we must determine, in a more precise manner, the various purposes the cannon can serve in field warfare and then, examine if, for a definite sum of resources, the combination of the 8 and 4 calibers serves better these purposes than the intermediate 6 caliber. If the reasoning itself did not suffice to establish the advantages of the 8 caliber or the 6 caliber in the formation of the batteries… it would rely on the memories of the past to convey its undeniable advantages … Twenty years of brilliant success had sanctified it. Nobody can feel more inclined than an artillery officer to grant the personnel a share of merit it has to claim in these successes; yet it is for the same officer to judge to what extent the nature of the weapon has played a part in obtaining these successes. It seems impossible to deny that the material and positive superiority of a caliber more significant than the usually weaker caliber, had a lot to do with the superiority of our horse artillery batteries generally accepted at the time of the war currently being discussed. This opinion was so widespread that the gunners brought themselves reluctantly to renounce a weapon that so many reasons of pride and trust made it precious to them. They seized with eagerness the opportunity to take it back, wherever the 8 caliber was still accepted in the composition of field companies, in competition with the 6 caliber, which has been introduced in our armies only successively. The addition of the new 6-pounder into the French artillery simplified many issues, such as ammunition resupply and the number of calibers used by the field armies. However, the Système AN XI was not fully implemented, only the 6-pounder and 5.5-inch howitzer being issued in large numbers. Furthermore, as has been noted, the new carriage for the 6-pounder was unsuitable and fell apart after hard campaigning, so the 6-pounder had to be remounted on the older Gribeauval carriages taken from the armories. On campaign, French artillery was organized by company, the companies being assigned to a separate corps under a corps artillery chief who was usually a general officer. Companies of the same regiment did not necessarily serve together, or even in the same corps, though sometimes it was specified that they should. There was no battalion-level organization in the artillery regiments. Corps artillery was organized with a corps reserve, and with every infantry division receiving one company of foot artillery. Those companies were also issued with four extra caissons to carry ammunition resupply for the infantry. There were also companies assigned to the army artillery reserve, that mission generally being taken over after 1809 by the larger Guard artillery. A typical artillery order of battle for a corps in the Grande Armée is represented by that of Davout’s III Corps at the Battle of Auerstadt on 14 October 1806. The French imperial corps of artillery, at this time, is composed of eight regiments of foot artillery, and six regiments of horse artillery. The full complement of the first is two thousand five hundred and eighty- two men, including the officers, and the total of the foot artillery is twenty thousand six hundred and fifty-six men. The full complement of a regiment of horse artillery is five hundred and twenty-four men, and the total is three thousand two hundred and twenty-nine men. Fifteen companies of artificers, ninety-two men including four officers, thirteen hundred eighty. Eight battalions of the train, the great complement of which is four hundred and seventy-seven men, and the total, including the officers, thirty-eight hundred and sixteen. When the battalions of the train are put on the war establishment, they are increased to the same number of battalions, of six companies, each of ninety-nine men, sixty of whom are conscripts. There are also two battalions of pontonneers of six hundred and ten men; officers, soldiers and artificers, total twelve hundred and twenty men. Fourteen companies of veteran cannoneers, fifty men each, seven hundred men, and one hundred and twenty-eight garde-côte companies of one hundred and twenty-one men each, which give a complement of fifteen thousand four hundred and eighty-eight men. The whole of the French artillery is thus forty-six thousand four hundred and eighty-nine men, including the officers. In this number are not included the sappers and miners, which were formerly attached to the artillery, and which now form part of the corps of engineers, the total of which is five thousand four hundred and forty-five men, exclusive of four hundred and twenty-eight officers, who compose the imperial corps of engineers. That artillery has poor drivers and poor horses. It daily blocks the roads, impedes the march of the regular artillery, and deprives the ranks of seventy to eighty bayonets which would do the enemy much more damage than these poorly served cannons which cannot march. Every day convinces me of the great damage that has been done to our armies by removing the regimental guns. I desire therefore that in the organization, each regiment will have two 3-pounders; but, during the time that we should have only guns and ammunition for 4-pounders, you will give them 4-pounders. The gunners, horses, and men of the train will be supplied by the regiments. In this case, Merle was right and his Emperor was wrong. 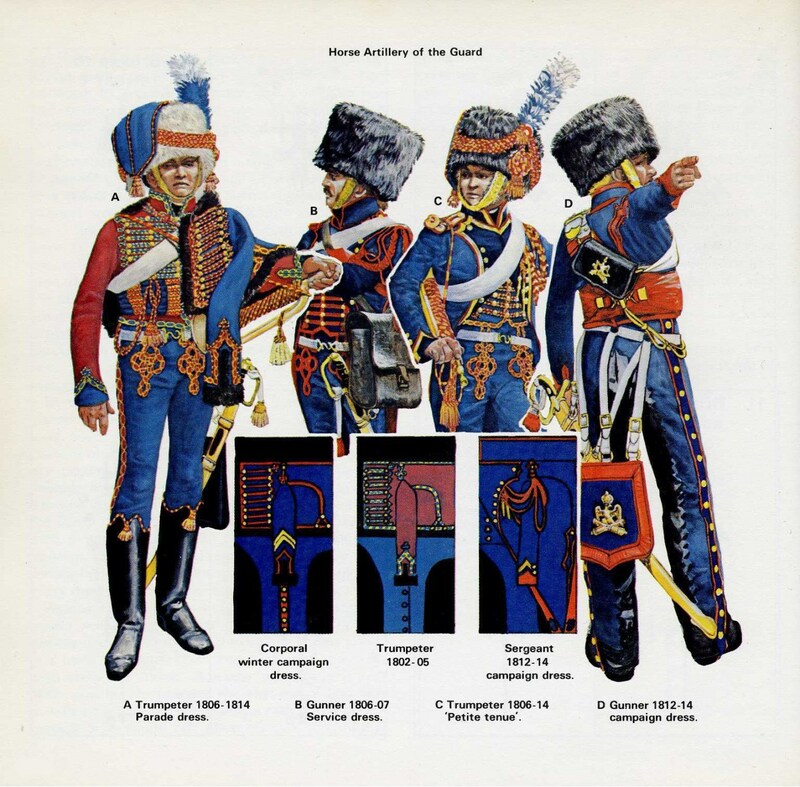 The regimental artillery did not serve well, and most, if not all, was lost in Russia. The most interesting artillery unit during the period was that was used by the Dromedary Regiment in Egypt. The attached artillery company consisted of two 4-pounders, two caissons, and ten dromedaries, each of which carried two men. The total company strength was 24 all-ranks, and it was formed on 25 November 1800. — Two batteries of horse artillery for the cuirassiers. This makes twenty-eight howitzers, twelve 12-pounders, and fifty-eight 6-pounders, a total of ninety- eight guns. Added to the sixty-four guns of the corps trains, this makes a total of 162 guns. By this means your five divisions will be organized. The number of wagons will therefore be 992. You must have only two train battalions. The infantry maneuvers of the platoon and battalion. Everything necessary to the gunner and the engineer in the field. Students will be led to the target range; they will lob bombs into the target barrel, fire blank cartridges, etc., and construct every kind of battery. They will continue their [initial] course of construction. In the third class, students would pursue their studies in hydraulic architecture, civil and military. They would busy themselves with the most complicated part of construction and learn everything necessary to direct and superintend the construction of a fort. They would take cognizance of the details of foundries, mines, etc. The fourth class would be dedicated to perfecting the students in the different subjects that they have been studying. They would go over all the details of arsenals, mines, galleries, etc.—in brief, everything that would complete their instruction as engineers and gunners would belong to the curriculum of this class . . . In general, in the establishment of a school for engineers and artillery, one should consider the knowledge of the maneuvers of all the guns and the tactics of infantry as the principal object. When a student is admitted to the School of the Battalion, he would be forced to perform the manual of arms and the maneuvers of the battalion at least three times every ten days. It is important for the maneuvers of artillery to keep in mind that nothing is more uncertain that the art of firing. 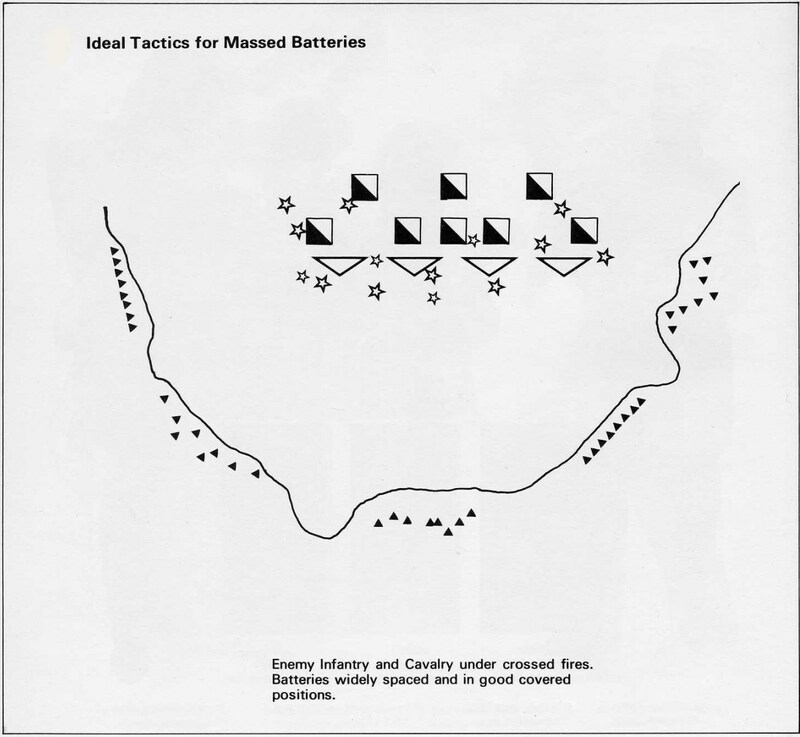 This portion of the military art is classified among the physio-mathematical sciences, yet its results are dubious; those of practice are certain. Students having completed one course in mechanics know nearly everything that they must understand and apply. It is appropriate therefore to strive above everything else, and not as one of the foremost foundations of the instruction, to see that each student executes the manual of arms and all of the maneuvers of artillery better than a veteran soldier, that he is skilled in large practice and has perfect knowledge of the employment of artillery. No one can be considered a good student if, upon graduation, he cannot go immediately to a battery or a siege. It is proper that upon joining his unit he should instruct a class of recruits in the maneuvers of artillery and infantry and in the mechanical maneuvers. How often do you not see officers unable to place a gun carriage, direct a mechanical maneuver, fashion explosives, and forced to take lessons from old sergeants? When a student can aim a gun better than the soldier, no one will question either his right to advancement or the other advantages of his education. Old sergeants will not be jealous of these young officers when they never have to teach them anything. 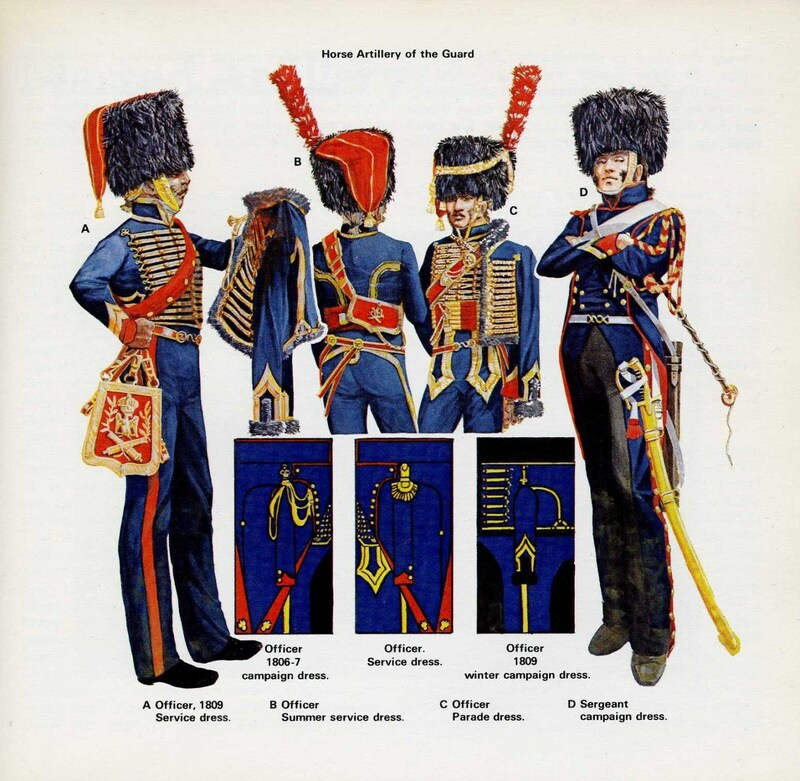 Each French artillery regiment in the old Royal Army was an artillery school. The seven artillery regiments went by names, and were not numbered until the Revolution did away with the names of all regiments of all arms, as they were a vestige of Royal prerogative. The French military school system of the old Royal Army was disbanded by the Revolutionaries in 1793 (it was the same with the Royal Stud Farms, which were closed and had their horses sent to the field armies). Some enlightened ones finally realized that you could not train artillery and engineer officers without some degree of formal schooling, so in 1794 the Ecole Polytechnique (originally called the Central School of Public Works) was opened. However, not all of its graduates went into the service, many opting for civilian employment instead. Napoleon set to work immediately to remedy the situation as First Consul. The Châlons artillery school was revived, as was the Ecole de Mezières, though the latter was moved to Metz and was later combined with Châlons in 1802 to become the excellent École d’Application de l’Artillerie et du Génie. St Cyr evolved from a combination of the Prytanée Militaire and the military school at Fontainebleu during the period, and the top ten percent of its graduates went into the artillery by 1811. Napoleon had been very well educated, first at the newly established military school at Brienne, and then at the prestigious Ecole Royale Militaire, where he finished the two-year course in one year and was commissioned a sous-lieutenant at sixteen. He was further very well self-educated, reading all the pertinent military literature that was available (which was considerable), especially Jean du Teil’s De l’Usage de l’Artillerie Nouvelle dans la Guerre de Campagne. He wanted his officers to be so educated, as he did by developing his public school system for the civilian population. Finally, two anecdotes from the ubiquitous Major Boulart, who was a witness to Senarmont’s chevauchée at Friedland in 1807 and was a well-trained and skilled officer who took great pride in his Guard artillerymen, are given below. Both of these incidents took place during the buildup for and invasion of Russia in 1812. For quite a while my gaze followed the three Guard batteries under a well-nourished fire and covered with a hail of roundshot whose falls one could only see by the dust they were raising. I thought they were lost, or at least half so. Happily, the Russians aimed badly, or too high.